High specification office accommodation, with great ecologically- sound features, in a beautiful rural location. State of the art IT provision within beautiful period buildings. 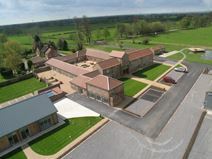 Situated in Easingwold, close to York. Easily accessible, being located off the A19. York railway station is within easy reach, offering mainline services to London, Edinburgh and Manchester. This business park location is 12 miles from York and 25 miles from Middlesbrough. It provides a range of traditional leased or modern serviced office space that is surrounded by beautiful countryside.